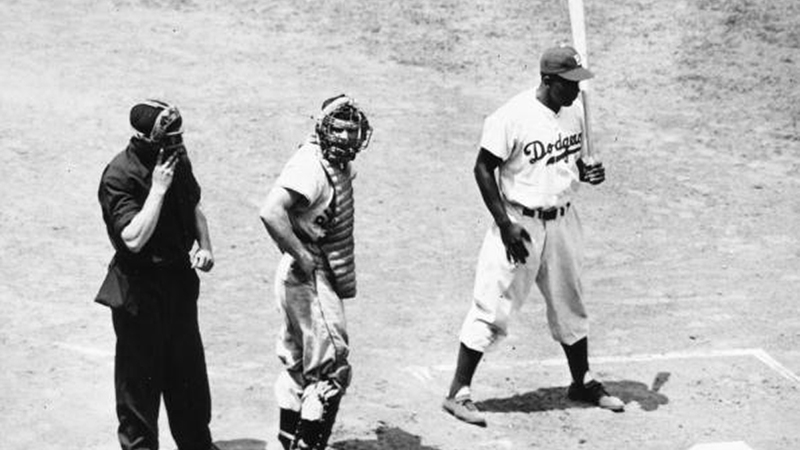 Ebbets Field played host to a historic All-Star Game, with African-American players selected to the game for the first time, including Jackie Robinson, Roy Campanella and Don Newcombe for the National League, and Larry Doby in the American League. It was Joe DiMaggio who left an impression from a scoring standpoint with two hits and three RBIs. a-Flied out for Brissie in the 7th. 1-Ran for Kell in the 6th. 2-Ran for DiMaggio in the 6th. 2B: Tebbetts (1, Newcombe), DiMaggio (1, Bickford), DiMaggio (1, Bickford), Gordon (1, Pollet), Mitchell (1, Pollet). TB: Dillinger; Gordon 2; DiMaggio 3; DiMaggio 3; Joost; Kell 2; Mitchell 2; Tebbetts 3; Robinson. RBI: DiMaggio 3 (3), Robinson (1), Tebbetts (1), Joost 2 (2), DiMaggio (1), Dillinger (1), Mitchell (1). 2-out RBI: DiMaggio; Robinson; Tebbetts; Joost 2; DiMaggio; Dillinger; Mitchell. Runners left in scoring position, 2 out: Parnell; Joost; Trucks; Robinson; Doby. SB: Kell (1, 2nd base off Spahn/Seminick). a-Singled for Newcombe in the 4th. b-Struck out for Munger in the 5th. c-Flied out for Bickford in the 6th. d-Flied out for Blackwell in the 8th. 1-Ran for Mize in the 3rd. 2B: Robinson (1, Parnell), Gordon (1, Brissie). HR: Musial (1, 1st inning off Parnell, 1 on, 1 out), Kiner (1, 6th inning off Brissie, 1 on, 2 out). TB: Schoendienst; Mize; Musial 6; Gordon 2; Kazak 2; Kiner 4; Hodges; Robinson 2; Pafko. RBI: Musial 2 (2), Newcombe (1), Kazak (1), Kiner 2 (2). 2-out RBI: Kazak; Kiner 2. Runners left in scoring position, 2 out: Seminick; Kiner; Pafko; Robinson; Reese. E: Mize (1, missed catch), Reese (1, fielding), Seminick (1, fielding), Marshall (1, fielding), Campanella (1, missed catch). Parnell pitched to 3 batters in the 2nd. Game Scores: Parnell 35, Spahn 39. Groundouts-flyouts: Parnell 1-0, Trucks 3-0, Brissie 5-3, Raschi 2-1, Spahn 2-0, Newcombe 2-5, Munger 2-0, Bickford 2-1, Pollet 2-1, Blackwell 0-0, Roe 2-1. Batters faced: Parnell 8, Trucks 9, Brissie 16, Raschi 13, Spahn 12, Newcombe 12, Munger 3, Bickford 6, Pollet 7, Blackwell 3, Roe 3. Inherited runners-scored: Trucks 3-1, Newcombe 2-0. Umpires: HP: HP Umpire. 1B: 1B Umpire. 2B: 2B Umpire. 3B: 3B Umpire.